Several minutes into my unscheduled Civilization Beyond Earth hands-on demo, I noticed the bang and whir of power tools all around me. They were literally deconstructing the booth on all sides of us as a Civ designer urges me to play "just one more turn." Just to be very clear, E3 is a ton of work for everybody involved. Whether you're putting on the show, building or staffing a booth, or covering the show for a publication, you're going to be exhausted by Thursday afternoon. I know I was. I had walked more miles in the last three days than in the entirety of the previous year combined. I'd watched demos, taken notes, written stories. I'd eaten like crap, and occasionally had too much to drink on a largely empty stomach. I've never worked the other side, so I don't have a comparison, but I can say with confidence that the folks staffing the booth have it as bad or worse than those covering the show. When time finally came for my 2K appointment at 3pm on Thursday, I was not expecting much from the booth staff. They'd been on their feet for three days, and somehow managed to maintain a super positive demeanor. Despite the fact that I've been incredibly excited for both Civ and Borderlands, I was fairly low energy, but they kept me chatting and entertained while I waited for the next Evolve presentation. From the booth staff to the PR team, the experience at 2K's booth this year was phenomenal, and I haven't even made it to the games. 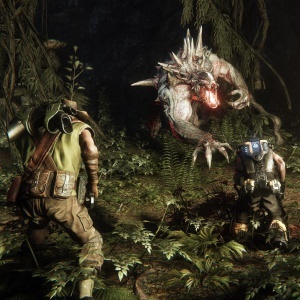 Evolve pits four players against a monster, in this case the Kraken, a floating, energy-ball throwing, electrified monstrosity. I had the privilege of playing the monster and, despite eventually dying, I felt seriously badass pretty much the entire time. I'm convinced the opposing Medic was a professional, given how expertly they managed to sneak into the fray, heal some friends, revive the downed teammates, then stealth and disappear just before I was able to land a killing blow. Frustrating certainly, but exactly the kind of challenge I like in a game. Borderlands the Pre-Sequel puts you on Pandora's moon, in a low-gravity environment where air is available in limited quantities. You'll pick up air canisters as you defeat enemies, or you can recharge at stations situated around the world, but don't run out for too long, or you'll die. Your jetpack uses up air, too, though, so sometimes you have to decide between breathing and double jumping. I almost invariably opted to double jump. Borderlands the Pre-Sequel felt a whole like like more Borderlands 2, only with double jump, laser beams, and freeze weapons, which I'm perfectly okay with. You'll get a new selection of classes, but be prepared for an otherwise very similarly enjoyable experience. Additionally, the 3-minute theater presentation was the best of the show, coining awesomely entertaining phrases like "joy puke." Finally, there was Civilization Beyond Earth. I watched the 20-minute theater demo, which served to get me even more excited. After the presentation, I learned that that was all they had planned. The show was about to close, and there were no plans to get me hands on with Beyond Earth. I asked one of the scrambling booth staff, most of whom were trying to prepare to strike the booth, and they stopped what they were doing to introduce me to someone that might help. Long story short, it worked. After another 20 minutes, 2K got me in to experience Beyond Earth for myself. The designer that was showing me around ignored the power tools all around us, and urged me to take another turn, like you do. I managed to take out an alien nest, excavate some ruins, collect a resource pod, and hunt down another batch of aliens to wipe out. Then, miraculously, I ran out of time. I thanked them all profusely and ran to meet the team for The Escapist's post-show podcast. I know it's not universally true, but E3 is largely a working show. Most of us are not just fans here to play games we're excited for. We're here to do a job, be it showing off a game, coordinating crazy schedules, or delivering coverage from the show. 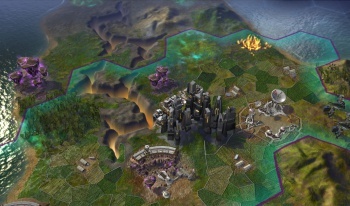 As much of a fanatic as I am for Civ, I'm also here to do a job, and 2K respected that fact. Not only did 2K deliver a truly impressive lineup of games this year, but the team at the booth did an impressive job of planning and, more importantly, throwing all planning out the window when it was necessary. Sarah LeBoeuf was similarly impressed with Nintendo's showing this year. Check out her thoughts on why Nintendo really stole the show.